The compressor impeller is an aluminium alloy (LM- 16-WP or C-355T61) investment casting, with a gravity die-cast aluminium housing (LM-27-M). The design of the impeller is a compromise between aerodynamic requirements, mechanical strength and foundry capabilities. To achieve high efficiency, and minimum flow blockage, very thin and sharp impeller vanes are required, thickening at the root (impeller hub) for stress reasons. It is common practice to use splitter blades that start part way through the inducer, in order to maintain good flow guidance near the impeller tip without excessive flow blockage at the eye. 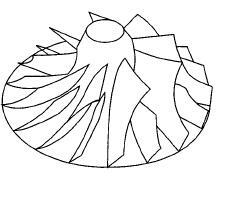 Until recently the impeller vanes have been purely radial so that blades were not subjected to bending stress. However most recent designs incorporate backswept blades at the impeller tip since this has been shown to give better flow control and reduces flow distortion transmitted through from impeller to diffuser. Automotive turbocharger compressor impeller, with splitter blades. 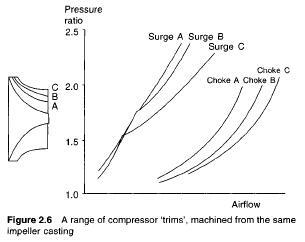 Typical design point pressure ratios fall in the range of 2 to 2.5:1, requiring impeller tip speeds of 300 to 350 m/s, hence small units of typically 0.08 m tip diameter rotate at 72 000 to 83 000 rev/min. In order to match wide differences in air flow requirements from one engine to another, a range of compressor impellers is available to fit the same turbocharger. These will be produced from one or two impeller castings, but with different tip widths and eye diameters generated by machining as shown in Figure 2.6, and matched with appropriate compressor housings. Usually up to ten or more alternative ‘trims’ are available but since the impeller tip diameter is unchanged and the hub diameter at the impeller eye is fixed by the shaft diameter, the flow passage variations alter the efficiency as well as flow characteristics of the impeller. The compressor can be a loose or slight interference fit on the shaft, clamped by the compressor end nut. Impellers of most turbochargers are balanced before assembly onto the shaft, so that components can be interchanged without rebalancing. Vaneless diffusers are used on all except very high pressure ratio compressors. Relative to the alternative vaned designs, the vaneless diffuser is slightly less efficient due to a longer gas flow path and poorer flow guidance, but has a substantially wider range of high operating efficiency. This is important in truck and passenger car applications where engine speed, and therefore mass flow range, is large. The volute acts not merely as a collector of air leaving the diffuser, but is usually designed to achieve a small amount of additional diffusion in its delivery duct. Generally the volute slightly overhangs the diffuser in order to reduce the overall diameter of the turbocharger. 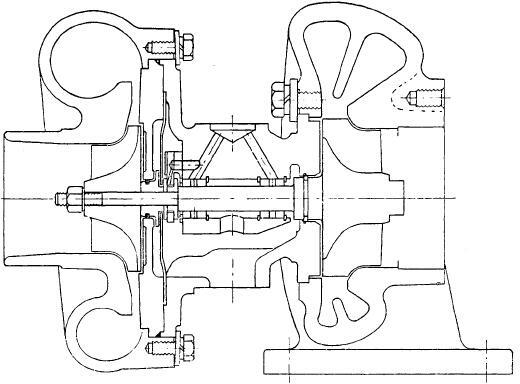 The volute and impeller casing are invariably formed as a single component. 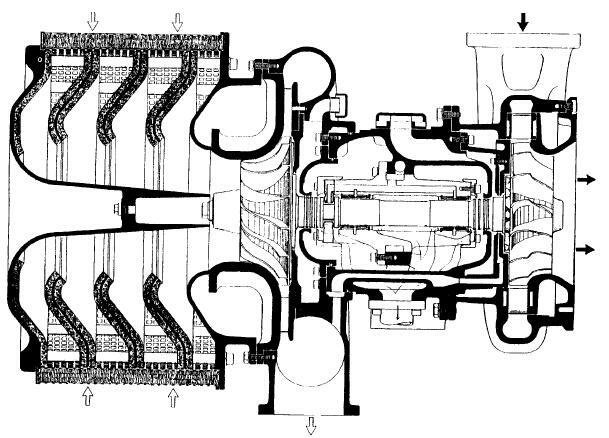 A turbocharger is an exhaust-powered supercharger, that unlike conventional superchargers, has no mechanical connection to the engine (Figs. 9-3b and 9-4). 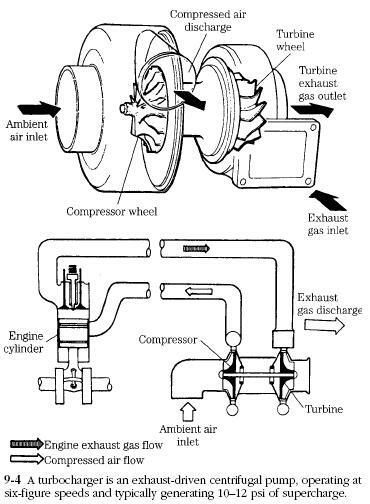 The exhaust stream, impinging against the turbine (or “hot”) wheel, provides the energy to turn the compressor wheel. For reasons that have to do with the strength of materials, turbo boost is usually limited to 10 or 12 psi. This is enough to increase engine output by 30—40%. Turbocharging represents the easiest, least expensive way to enhance performance. It is also something of a “green” technology, because the energy for compression would otherwise be wasted as exhaust heat and noise (Fig. 9-5). On the other hand, the interface between sophisticated turbo machinery, turning at speeds as great as 140,000 rpm and at temperatures in excess of 1000°F, and the internal combustion engine is not seamless. Unless steps are taken to counteract the tendency, turbochargers develop maximum boost at high engine speeds and loads. The turbine wheel draws energy from exhaust gas velocity and heat, qualities that increase with piston speed and load. The compressor section behaves like other centrifugal pumps, in that pumping efficiency is a function of impeller speed. At low speeds, the clearance between the rim of the impeller and the housing shunts a large fraction of the output. At very high rotational speeds, air takes on the characteristics of a viscous liquid and pumping efficiency approaches 100%. In its primitive form, a turbocharger acts like the apprentice helper, who loafs most of the day and, when things get busy, becomes too enthusiastic. 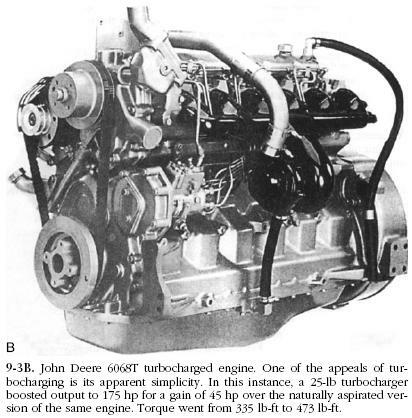 Another innate, but not necessarily uncorrectable, characteristic of turbocharged engines is the lag, or flat spot, felt during snap acceleration. Perceptible time is required to overcome the inertia of the rotating mass. By the same token, the wheels continue to coast for a few seconds after the engine stops.